What makes you happy about marketing your business? 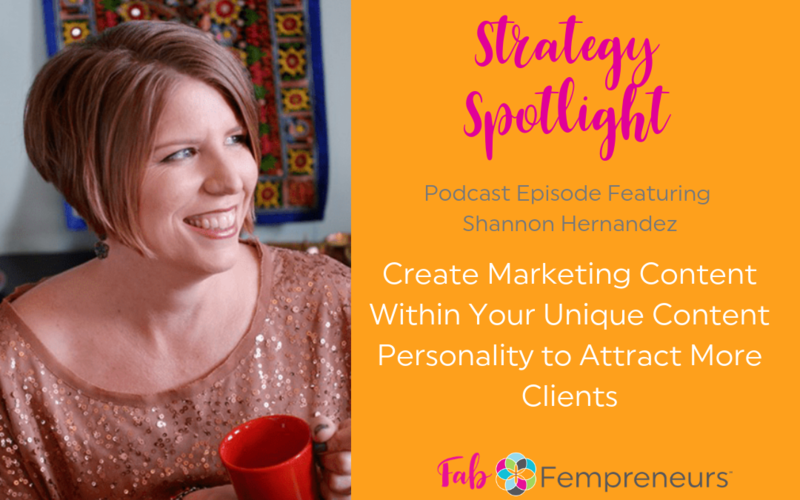 In this Episode of the Fab Fempreneurs Podcast Show, we feature Shannon Hernandez of M. Shannon Hernandez Consulting who shares the power of knowing your “content personality” when choosing marketing strategies to grow your business. Knowing what style or way of marketing you’re most effective with can be discovered through her simple (less than 5 minute) content personality wheel quiz which reveals your top 2 preferred methods of delivery. She also explains how to use your independent marketing personality and blend your top two marketing personalities to create a marketing strategy to build your business the way you want to build it. 1) Marketing should be fun. If you are having fun, you can show up as your BEST self. 2) Work within your “sweet spot”. The greatest possible results with the greatest ease. 3) How to properly use your tools to build a continuous 3 month marketing strategy. 4) People want real people. No one’s life is perfect and if you tell the truth you gain the customers you actually wanted.